Supplied: In three litre containers of peat free compost, healthy and well established, approximately 40-60cm (2 feet) high, with full planting and aftercare instructions. The Grand fir, or Abies grandis, is, arguably, the preeminent fir tree of North America and it fully lives up to its name. Its shiny, dark green needles, with silvery undersides, and its perfect, conical habit in youth, has made it the standard for Christmas trees. A moderate-growing evergreen tree, it reaches about 7-10 meters in 10-15 years. At maturity it can reach heights of 30-50 meters plus, ensuring that a mature specimen towers above the garden as a powerful, vertical accent with attractively layered branches. Smooth gray bark covers the trunk and gradually matures into a patchwork of plate-like squares, not unlike many pines. 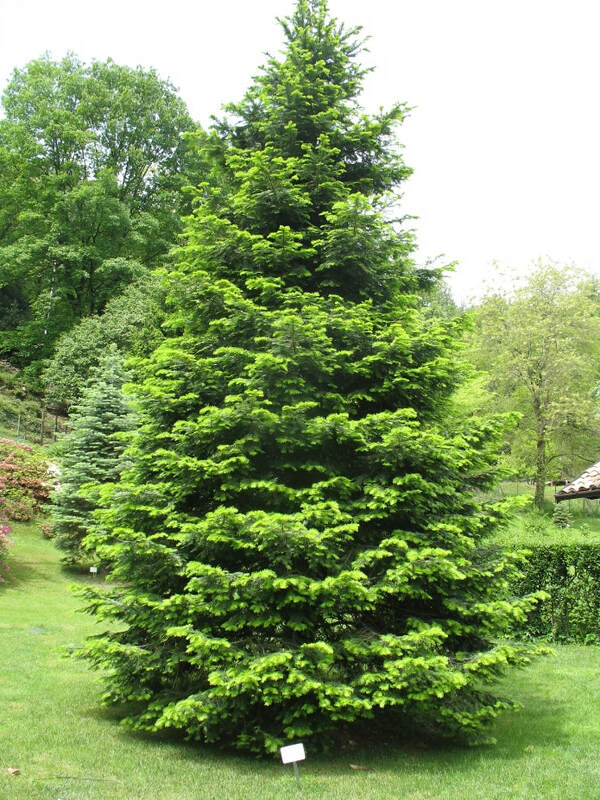 To reveal its natural stateliness, provide plenty of space as a Grand fir is the quintessential specimen tree and is best suited for large properties, parks and estates. Though young trees will happily tolerate shady understory conditions, Grand firs do best best with full sun in reasonably fertile and well-drained soil. It is drought tolerant once established and has no serious pest problems. Native to the Pacific northwest of America, Abies grandis loves the similar growing conditions found in the UK with moderately cool summers and winters. Fully hardy.